This is my Mom's favorite recipe 'Kare-kare' which my old work friends brought on my Mom's birthday. Instead of bringing cake they chose to bring this because I told them she's not fond of sweets. It's also my specialty but since I'm too busy with other preparations on her May birthday I opted to assign this to my friends - clever huh :-) With this they used the 'twalya' instead of my recipe which uses pork hind and some lean meat. We love kare-kare in our house because it has everything in it, vegetables,, pork and a very yummy peanut sauce. How about you? I love kare-kare but to go with it,it has to be the sweet tasting bagoong. i love kare-kare with beef "tuwalya" but i seldom cook it at home. 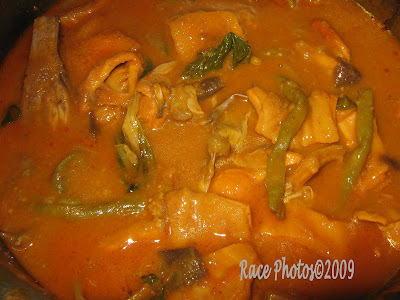 my favorite kare-kare is from Country Spice---the best kare-kare i've ever tasted! I was able to cook kare-kare twice already. Edible naman. We prefer pork hind too than twalya. Nice of your friends to bring kare-kare. I really miss that dish na. looks yummy! I love kare kare with lots of vegetables!